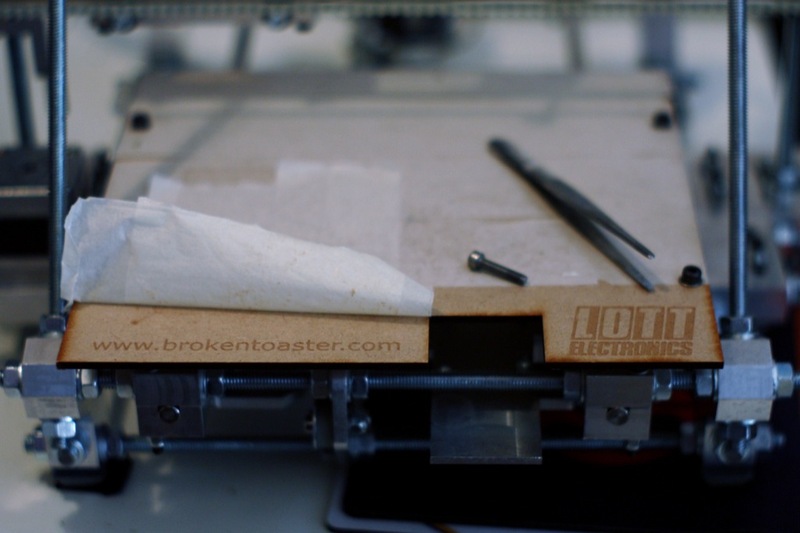 Open-source hardware and custom design from MP3 players to 3D printing. You’ve probably all noticed by now that Ponoko are now offering fabrication facilities in the UK via RazorLAB. I thought I’d post to show off my new laser etched bed for my Reprap Mendel. I could have cut this one by hand, but I got it lasercut and etched for reasons of curiosity. An MDF bed for my Reprap Mendel. Laser etched and cut at RazorLAB. I have to say that the service and turnaround from Ponoko and RazorLAB was great. Ponoko only promises a 28 day turnaround for non Prime members. My order was shipped in 3 days! Fantastic! The bed looks great and I’m happy with the results. For reference, the material used is 3.6mm ‘Natural MDF’ , and the text and logo are done in ‘Medium Raster’. All files were prepared using Inkscape. Although I think the bed is a little on the thin side for a perfect print surface, it is a lot flatter than the curved 4.8mm aluminium bed I have been using up until now. How much do they charge for a full set of Mendel thick sheet parts? USD$55 (£35) for 3.6mm MDF. USD$107 (£68) for 5mm clear acrylic. Including postage VAT and Delivery in the UK. If your in London you can pick up yourself and save about USD$10-$20 off the price. Sounds like it would be cheaper than cncrouting.co.uk then who gave me a quote for 6mm MDF at £65, plus £10 P&P. The Raspberry Pi has arrived!